Continuing low interest rates have handed George Osborne a windfall ahead of this month’s spending review, leading to expectations that the UK chancellor will use some of the cash to scale back £20bn of planned cuts. The difference could be £2bn annually, according to the Office for Budget Responsibility’s interest rate calculation programme. The data source is budgets from 2000 to 2015, including the July 2015 projections from the OBR (who I consider a part of the Treasury for these purposes). Constant prices are used to indicate real changes. 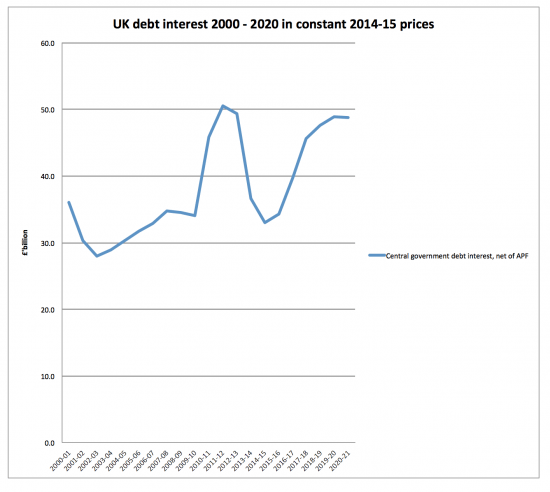 Note that what we are enjoying now are interest costs about the same as those Labour paid, which is interesting, given the narrative on this issue. And the reason why is the note that says ‘net of APF’. The truth is that the QE programme will make the UK £47.2 billion in four years to 2016-17. And then George Osborne wants to give this advantage away because he wants interest rates to rise to keep the banks happy. The cost? Well, not less than £25.2 billion, I would suggest (that’s the difference between an average savings rate of about £12 billion a year and forecast savings from 2017-18 onwards). To put that in context that giveaway to bankers to return them to what they think to be ‘normal times’ will cost more than £6 billion a year, on average. And tax credit cuts are designed to save £4.4 billion a year. It’s time we stopped wealth flooding up in society and used it to support those who need support. This government does not, unfortunately, seem committed to such a policy, but the reality is that this is all a choice on its part. There is no reason for this cost to rise. The massive gains from QE could be retained if a commitment to low interest rates was maintained. But the government is not making that commitment. It is instead hitting those worst off, and it is fair to ask why.